For the appearance and substantial feel of masonry columns with reduced weight at economical prices, FiberCrete™ GFRC columns and covers are the ideal column covers for your needs. They are cast from glass fiber reinforced concrete, and they provide superior performance characteristics and are an economically priced alternative to cast concrete columns. FiberCrete™ GFRC columns provide the look and feel of masonry without the issues with weather and water damage that you can have with concrete columns. Concrete columns are susceptible to moisture degradation and freeze thaw spalling and cracking. FiberCrete™ GFRC columns are also lighter in weight than concrete columns, cast stone columns and stone columns thereby making them easier and less costly to install. Our beautiful and economically priced FiberCrete™ GFRC columns and covers are available in diameters from 10” to 48”, and in column heights from 6’ to 40’. However, if your design needs columns from 6 inches in diameter up to 18 inches in diameter, you may want to substitute our even more economical DuraClassic™ Poly/Marble Composite Columns due to their lower price and other great features. DuraClassic™ columns are cast from fire rated fiberglass reinforced polyester resin marble composite. They also can be cast to be load bearing, or can be split for column covers, and can be easily installed around steel to provide a monolithic look that is free of visible joints. Our DuraClassic™ columns also offer a limited lifetime warranty. FiberCrete™ GFRC columns and covers are both durable and noncombustible. They can be supplied paint grade for field applied paint finishes, or we can custom cast them with your choice of prefinished colors such as limestone or other natural stone colors. They also can be cast in a range of different surface textures. In addition, FiberCrete™ column covers can also be color matched to coordinate with our comprehensive selection of MeltonStone™ Cast Stone balustrades and architectural elements. 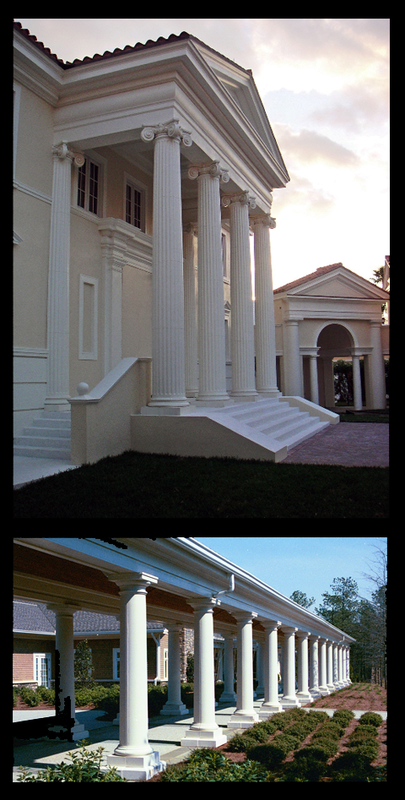 FiberCrete™ GFRC columns and covers are offered in a wide array of classical and contemporary designs. They are manufactured cast in halves and are designed to be non-load bearing column covers. They will have vertical half joints, and depending on height may be provided in lifts, and also have horizontal joints. They can be cast with entasis tapered shafts in any of the authentic classical designs of antiquity, or provided in a broad selection of contemporary straight shaft designs, with or without, banding and reveals as your design requires. Whether you want a classic entasis tapered Tuscan column design, or a straight shaft contemporary design with banding and reveals, Melton Classics has the ideal GFRC column cover design to enhance the beauty of your project at affordable prices. Please call one of architectural column specialists at 800-963-3060 today for a project consultation and quotation on beautiful FiberCrete™ GFRC Columns by Melton Classics.